Acy Brown has been with us about 8 years and is featured in Kali Mitchell's book. 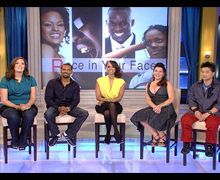 Tyra Bank's featured his photo on her back drop on the Tyra Bank's show. He is the good looking one third from the left. Tanya Fierro in an ElieG Body Shaper commercial showing the New Flex-EaseTM material. Stephanie Chuckel at the Super Chevy Show in Chandler AZ. Kali's second Calendar was picked up by Barnes and Noble, and Calendar Club as well as the previously named stores. Stephanie Chuckel in an ElieG Body Shaper commercial Stephanie has done many promotional bookings for us and a runway project at Desert Mountain Golf Club. Stephanie has lost a lot of weight since this commercial and boy does she look great now!!! Tanesha Griffin in a ElieG Body Shaper Commercial. Doesn't she look great?